There is so much lush landscaping at Beach Cove Resort that you might feel like you are on a tropical island in the Pacific instead of being at an oceanfront resort in North Myrtle Beach, South Carolina. Palm trees surround a bridge that is hidden on the sun deck and colorful flowers are a beautiful contrast to all of the sparkling blue swimming pools that are featured at Beach Cove Resort. The whirlpool at this North Myrtle Beach resort is extra large and most inviting. Families love Beach Cove Resort because of the amenities made especially for the children. The lazy river winds under this North Myrtle Beach resort and flows out into the sunshine as well. Look out for the waterfalls along the route of this 350-foot lazy river that will sprinkle water on you and your family as you float effortlessly underneath them. The kiddie pool at Beach Cove Resort has a mushroom waterfall in its center under which kids love to play. Beach Cove Resort has an indoor swimming pool that is shaped like a lima bean. This beautiful pool has a wall of floor-to-ceiling windows that allow swimmers to keep an eye on what is happening outside. Your kids will love to splash and play in this swimming pool that is in the shade. Pull up a chair at the pool bar and order a frozen drink or grab a table and order lunch for the whole family while you are enjoying a day on the sun deck at Beach Cove Resort. With sea breezes and sunshine as the backdrop of this oceanfront pool bar, it is difficult to imagine finding a more beautiful location for lunch during your North Myrtle Beach vacation at Beach Cove Resort. In addition to so many swimming pools, numerous hot tubs and amenities for the kids, this North Myrtle Beach resort has more. Overlooking the oceanfront pool deck and inside one of the three high-rise towers of Beach Cove Resort is a game room. Gorgeous views are admired from the wall of windows of this game room so you can play pool while being able to see pools of another nature. On-site dining makes it easy to get something to eat when you are hanging out at Beach Cove Resort and don’t want to make your own meal in your North Myrtle Beach vacation rental. There is also a gift store at Beach Cove Resort at which you can pick up some terrific souvenirs for folks back home. Your family will get hooked on this North Myrtle Beach resort because of its amenities and its central location to North Myrtle Beach amusements and attractions. You can easily wine and dine in North Myrtle Beach where award-winning restaurants and seafood buffets line Highway 17 and its surrounding neighborhoods. Water sports in the area include banana boat rides, parasailing, Sea Doo rentals and deep-sea fishing charters. Live entertainment theatres dot the landscape in North Myrtle Beach, SC and offer hours of family-friendly entertainment nightly. Some are even dinner theatres which are an especially fun way to spend an evening in North Myrtle Beach. The art of living by the sea starts with a North Myrtle Beach vacation at Beach Cove Resort. Easy to find along the North Myrtle Beach oceanfront, this large resort has beautiful North Myrtle Beach vacation rentals that sleep six or eight people and feature a long list of conveniences. It is also a North Myrtle Beach resort with one of the most impressive pool decks in town. 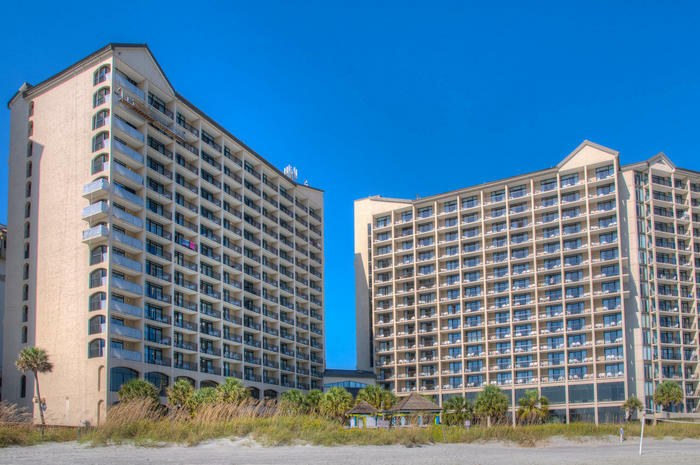 Whether you are interested in North Myrtle Beach for its renowned championship golf courses, popular white, sandy beachfront or lively entertainment, Beach Cove Resort is a haven at the end of every North Myrtle Beach vacation day. Make your reservations today.